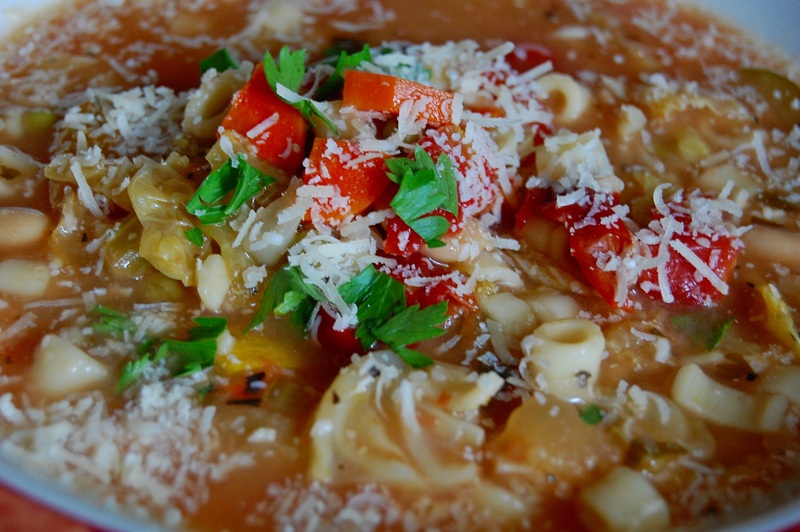 Minestrone loosely based on Recipes from an Italian Summer which is served warm…tonight it will be hot minestrone. I made the soup in the Crockpot adding the squash, macaroni, and cannellini beans during the last 2 hour period of cooking time, adding more broth from time to time as needed. 6-8 hours total depending on the accuracy of your slow cooker. Finely chop the lardons with the garlic and onion. When the mixture is quite fine, add the parsley and celery and chop. Put the mixture into a saucepan, add the tomatoes, carrots, potatoes, courgettes and oil and pour in 3 ½ pints water. Season with salt and bring to the boil over a high heat. Reduce the heat and cook for at least 2 hours. Add the peas, beans and cabbage, simmer for 15 minutes, then add the rice and simmer, stirring occasionally, for a further 18 minutes until it is tender. Stir in the herbs, ladle into a soup tureen and serve with plenty of Parmesan. This minestrone should be fairly thick. It is excellent hot, but it is also good served warm or cold in the summer.